Mascot Belmonte are a tough and durable pair of work trousers. It comes with numerous features that make these trousers an important piece of any workman’s protective clothing. Mascot Belmonte 04079-442 Mens Work Trousers Made from 65% polyester/35% cotton, 270 g/m² fabric. 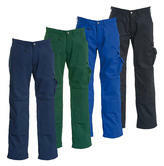 Portwest S885 Mayo Trousers are made from a durable and comfortable pre-shrunk TradeGuard polycotton fabric. Pre-shrunk poly-cotton trousers offer comfort and durability, a sewn front crease adds a professional look. Suitable for embroidery and customization, this garment is an excellent choice for corporate uniforms. Hook and bar closure fly for comfort. These trousers have two side pockets, and a jetted rear pocket with button closure. Portwest Mayo Trouser S885 Fabric: Tradeguard 245g - 65% Polyester / 35% Cotton. These stylish, hard wearing trousers from Portwest are abrasion resistant making them suitable for various work environments. They are triple stitched at the seams for additional strength and have reflective piping for visibility. It includes multiple pockets including knee pad pockets, mobile phone pocket and a double rule pocket as well as a hook and bar closure. Made from Kingsmill, 65% Polyester and 35% Cotton. Manufactured with 300g poly-cotton materials with Teflon® stain resistant finish. Stylish design, looks well throughout the day. The combination of materials ensures a comfortable and durable experience. Designed with Twin foldaway holster pockets to store tools and valuables. Triple stitched seams for extra product strength and durability. 2 front cargo pockets with mobile phone and tool/pen divisions. Also developed with front kneepad pockets, suitable for all generic kneepads. Durable triple stitched seams on leg and crotch, which extend the product life. The low waist with form-cut waistband, the trousers follow and support all body movements. Reinforced back pockets, thigh pocket and phone pocket with flap and hook and loop fastening. Orange contrast stitching, extra visibility with the help of reflectors. These trousers are Designed to look stylish and professional. 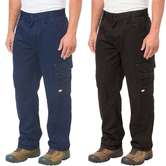 Comfort and durability are key features of this Portwest S885 Polycotton work trouser. High quality, pre-shrunk poly-cotton Trade Guard 245gsm fabric. Portwest S885 Mayo Work Trousers provides two side pockets and one jetted back pocket with button. Secure fit with a hook and bar closure system. Slash pockets in the side and back pockets with flap. Tool pocket with pen pocket. Snickers Workwear 5082 Trousers are made from 65% Polyester, 35% Cotton. Two front crossover front pockets for easy access. Two back pockets, the right one comes with a protective flap. Two leg pockets with outer compartments for added convenience. Excellent garment that will keep you warm and dry. Patent fabric combines an outer layer of stain-resistant Polyamide with an inner layer of cotton against the skin. These Snickers 3214 work trousers are extremely comfortable. Canvas+ fabric, with reinforced knees to offer protection in tough working conditions. The knee pad pockets are designed for the KneeGuard positioning system. 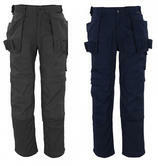 These multi pocket work trousers have eighteen pockets, which includes two easily accessible holster pockets. Snickers Workwear 5234 Trousers are made using DuraTwill fabric: 60% cotton, 40% polyester, 340 g/m². Featuring 100% Cordura®-Polyamide reinforcements. The Portwest TX36 300 trouser is made from Kingsmill fabric giving it a contemporary and comfortable fit. 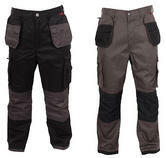 The stylish pair of trousers are durable and provide excellent abrasion resistance. It includes a hook and bar closure, a hammer loop, reflective piping and a multiple range of pockets, including knee pad pockets and double rule pocket. Made using Kingsmill, 65% Polyester and 35% Cotton. Snickers Workwear 3214 Holster trousers are exceptionally hard wearing trousers ideal for rough work environments. The fabric applied to manufacture these trousers is Canvas+, which is composed of 60% cotton and 40% polyester. These fibres each have great benefits, and when combined, present wearers of the material with ease of care, durability, breathability and comfort. 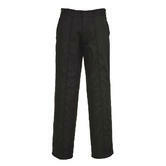 Portwest Ohio Trousers are a very durable work trouser made with Buildtex fabric. Ideal for builders, carpenters and plumbers. Pockets and features are positioned in the right places to give you more efficiency whilst working. Made from 55% Polyester / 45% Cotton. Polyester is a synthetic material, while Cotton comes naturally from a plant. When you combine the two materials for work trousers, there are several benefits. Polyester is a far more durable, shrink resistant and colourfast material. So, when you combine polyester with cotton, you get the best of both: Poly/cotton combines the softness of cotton with the durability of polyester. Poly cotton work trousers tend to keep their shape and colour, are not prone to wrinkling, and shrink very little, even when washed with warm or hot water. 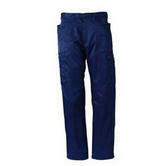 Some of the most popular poly cotton work trousers are the Dickies Redhawk WD864 Royal Blue work trousers. These are worn widely by tradesmen and on sites acress the UK. More working trousers styles include: Snickers 3214 Tan poly cotton work trousers. What work trousers are and are not! :"Work trousers" as a description differs to "cargo trousers" - in that cargo trousers typically have external or hanging pockets. Pleated work trousers: So when you look for polycotton work trousers you can expect plain trousers and even with a permanent crease mark or pleat -such as the Portwest S886 navy Pleated worktrousers or the Portwest Mayo pleated trousers in grey, black or navy or even the Orbit 245gm navy trouser. Lighweight work trousers: Work trousers are typically 9oz cotton or 250gm. 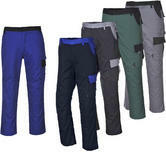 So, if you want lighterweight trousers - for summer wear etc, why not consider the Orbit 205gm lightweight trousers. But if you want good, warm, relatively heavyweight 300gm work trousers, we have you covered too! : The Dickies Eisenhower EH26800mis exceptionally popular, given our cold climate. Hi vis work trousers: hi vis orange work trousers are the most common (as they are suitable for use on railways), but we also supply hi vis yellow polycotton work trousers, and both are certified to EN 471 hi visibility norm. Poly cotton work trousers with knee pads: Protect your knees when working! (We dont realise the cumulative damage to our knees, from hits and bangs). 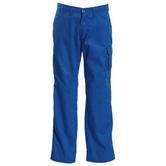 We supply poly cotton work trousers with knee pad pockets. Stain resistant polycotton work trousers: Make life easy on yourself and reduce the amount of dirt and stains on your clothes. The Blackrock Grampian stain resistant, Teflon-coated work trousers are possibly the most popular work trousers we sell! We hold many 1,000s of work trousers in stock, for same day despatch. So, if you cannot find the style or size you want, just email us on sales@northseaworkwear.com or call us during working hours on + 44 2871286100.